We’re always touting how easy it is to breathe new life in your room simply by switching out throw pillows. It’s true, a group of new fabrics and colors can give your space a totally different feel, but that doesn’t mean it’s easy to cull through all of the thousands of great throw pillows in every shade imaginable to find 4 or 5 that will work well for your space. There’s an overwhelming selection out there, which makes the process confusing! Well, we want to make things easier for you. Consider this our guide to choosing the right throw pillows for your room. Choose one cohesive color palette and do not veer from it. You’re going to get the most impact if all of your pillows are either in the same shade or in a pair of complimentary shades. Shoot for a symmetrical arrangement, whether it’s on your couch, bed, or a window seat. When you’re layering several different fabrics on top of each other, things can get really busy, really fast. 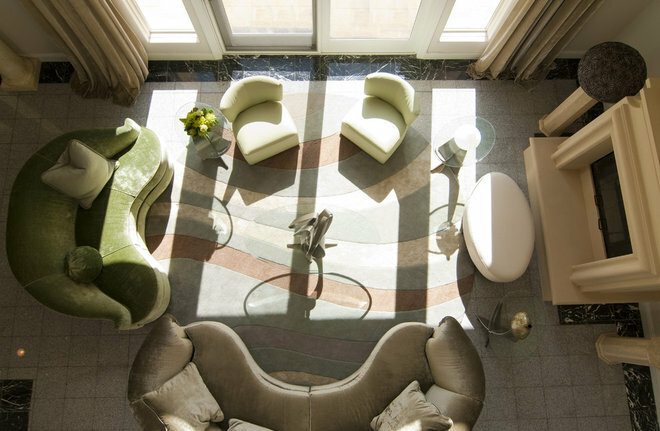 We like a symmetrical arrangement because it keeps things feeling orderly and polished. One simple print, one busy print, and one solid. This is a basic formula that’ll help you narrow down your options. Another way to think about it is — one small print, one big print, one solid. Your busy/large print should be on your largest pillows or the pillow that is front and center, as this print will usually set the tone for not just your pillow arrangement but the rest of your room. Plaids and stripes work well as small/simple prints. As your move towards the inside of the sofa, the pillows should get smaller. Visually, your largest pillows should be in the far corners, and your smaller pillow should be on the inside. But also for comfort, it makes the most sense to add the large 22 or 24″ pillows on the sides, where you won’t need to move them out of the way. A small 12×20″ pillow right in the center won’t make you feel like you’re perched on the edge of the couch because the pillows are taking up all of the room! Although decorative, pillows are really meant to add comfort to your upholstered furniture pieces, so don’t go overboard! We’ve all sat down on that couch that is so packed to the gills with throw pillows that you feel like you’re being shoved into a bag of marshmallows. This is not the situation you want to create, so if you have to ask if you have too many, take on or two away! Once you have these basic principles down, you’re ready to pick out fabrics! This is the fun part, but also the time when we become the most confused. There are just so many options! 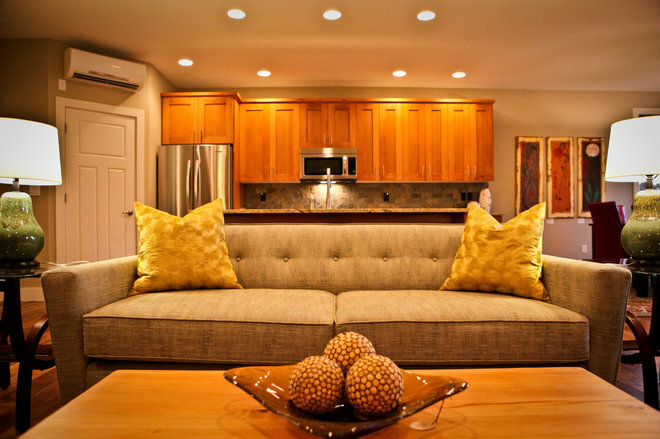 To narrow it down, consider the style you’d like to create in your home. If your room already has a lot of patterns, like a patterned sofa, dramatic curtains, or a vibrant rug, take your pillow fabrics down a notch. Or if you really like color but don’t want to use a vibrant hue on large pieces (like your sofa or club chairs) just use solid pillows in very vibrant hues. Here, we chose two colors that are on the opposite ends of the color wheel (called complimentary colors), a spicy orange and a cool blue. 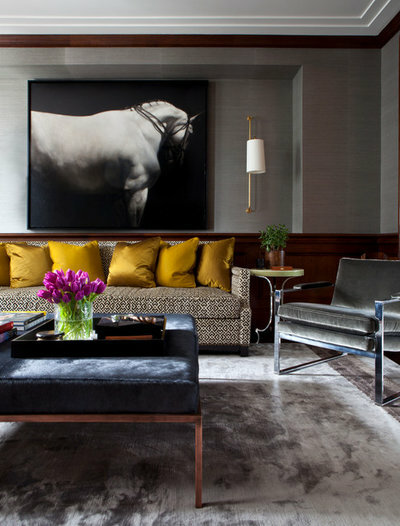 Colors look extra rich and vibrant when placed next to to complimentary colors, making the overall look much more dramatic. Individually, they look nice, but together they really sing! If you’re starting from scratch, find a fabric, an art print, or an accessory as a jumping off point. 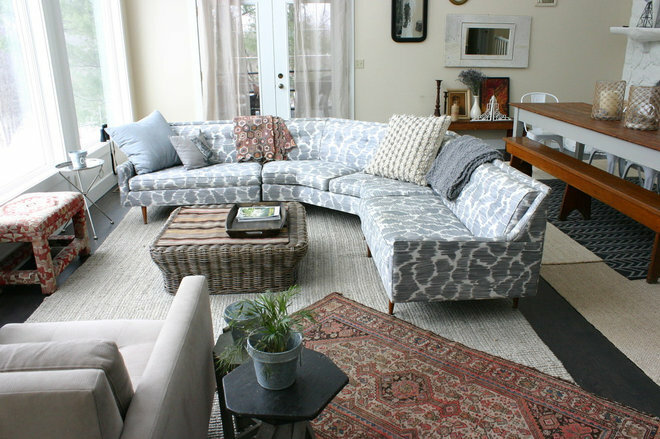 For example, we picked the gorgeous plaid throw on the back of the sofa and let it inspire the rest of the space. The spicy orange and navy are both found in the blanket, so we picked pillows in solid shades for maximum color impact! If you want a group of pillows in just one color, choose three different fabrics that work together. We used a very organic, bold print as our jumping off point (the floral pattern in the center), and we balanced the color on the sofa with bold velvet pillows in the corner and plaid pillows in the middle. The basic key here is balance. 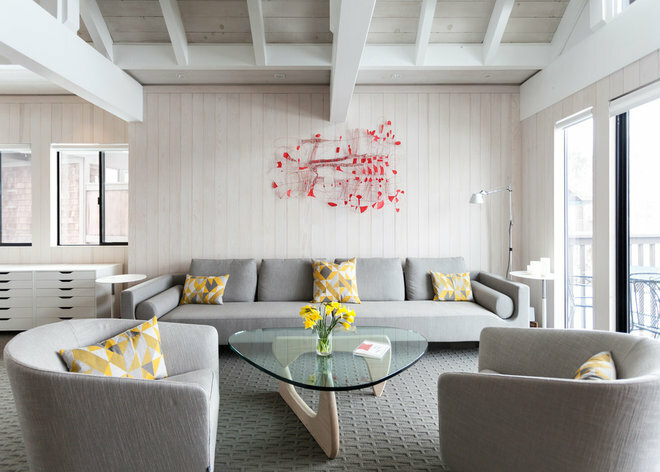 The bold pillows in the middle and in the corners help to balance the off-white sofa and lighter plaid pillows. The feminine floral print (our Rayna fabric) in the center is balanced by a more masculine plaid print on either side. And the patterned pieces are a balance to the solid pieces. Even if you want to keep your color palette neutral, you’ll still need a few throw pillows to bring texture and pattern to your space. For this combination, we chose a color palette of off-white, taupe, and chocolate. We started with our busiest print, our Leo Brown fabric, then we brought in a much larger print in a complimentary color, our Buffalo Check in Taupe. Finally to tie these two prints together and act as a backdrop, we chose a solid chocolate brown linen pillow with a contrasting flange. If you like color but want a group of pillows that aren’t too loud, choose colors that are next to each other on the color wheel, or analogous colors. These are colors that have a lot in common but are different, which makes for a color palette that is quieter and more polished. For the sofa above, we chose pink and orange. These two colors are neighbors on the color wheel, but they’re still a great pairing. We also picked two art pieces to hang over the couch that reinforce the pink-and-orange combination. 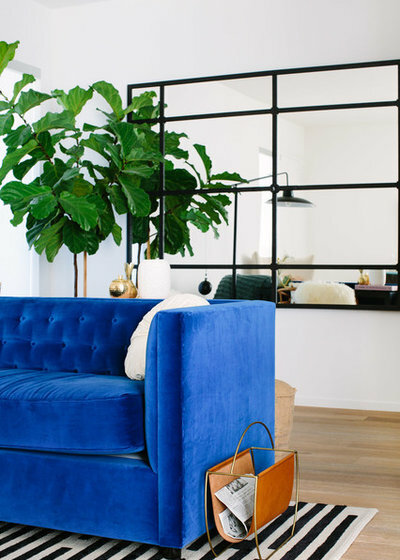 We love the way a well placed solid pillow in a vibrant color can act like an exclamation point on your couch. A rich, sapphire blue stands out the most, even though there are patterns and other colors here too. 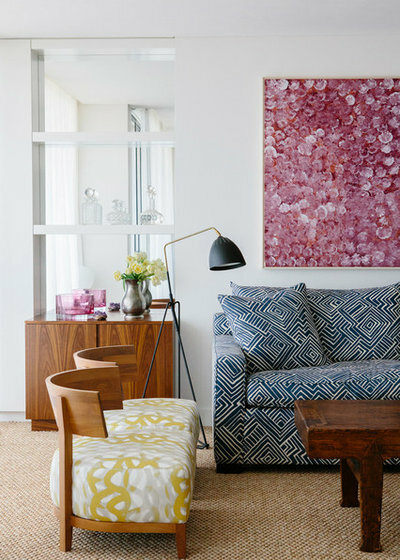 A solid pillow may seem like a boring choice when there are so many lovely patterns out there, but in the right space, one solid pillow in a bold color can really establish a color palette that may have been hiding. 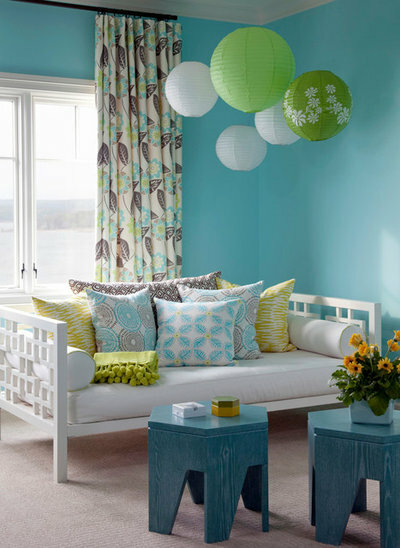 If you want to breathe new life into your space with very little effort, use a couple of solid pillows in a bold color in your space. Pull this color from other patterns on your upholstered pieces or in your accessories, then use that color in punches throughout your space. If you’re looking for an approach that isn’t fussy, we love to simply pair one bold color in a lush fabric (here we used velvet) with a classic stripe. Stripes are a great pattern to use for pillows because they’re the perfect balance of bold and simple. Our strategy here was easy enough, choose one bold color used elsewhere in your space for three pillows, then bring in two striped pillows for a little pattern. Ok, after all of this talk of colors and patterns, it’s time to get down to the less exciting details … like inserts. Just like the filling inside your sofa, what’s on the inside is just as important as the outside, even with throw pillows. Pillows are meant to bring extra comfort and cushion to your couch, so it’s important to use good quality throw pillows. All foam throw pillows aren’t going to be your first choice for support when you’re trying to curl up for a nap on your couch. You don’t necessarily need the most expensive inserts, but do choose inserts that include both feather and down. We’re obviously partial to our own down blended inserts which are 95% feathers and 5% down. Here’s another little secret when you’re choosing inserts for your pillows. If you want a fuller pillow, size up your insert. For example, if you have a 20″ cover, and you want a really full pillow, use a 22″ insert. Now, are you ready to choose pillows for your space? Do you feel empowered to mix patterns and colors like a pro? You should!